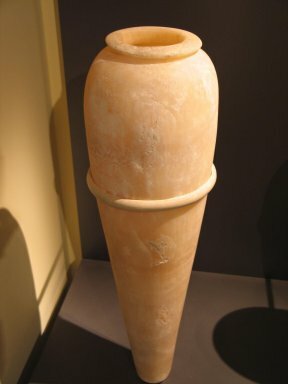 Large calcite (alabaster) vase with pointed base. The vase is very similar to 34.977 and has a pointed base. The body tapers from the rim down; undecorated. Condition: Rim is very slightly chipped and there are occasional spots of greenish-blue paint which may be traces of ancient decoration, though this seems improbable.